Browse our complete selection of elegant bamboo vases and Thai mango wood vases right here. All of our Asian vases are handcrafted by master artisans from natural woods grown in Thailand. 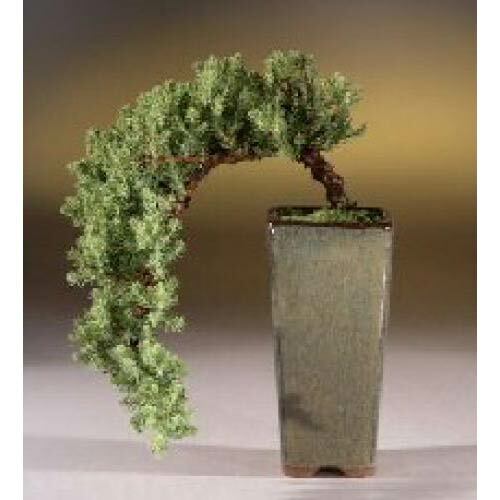 Skilled artisans carefully cut the wood into thin strips and curve them into the shape of the vase they wish to create. The wood of each Oriental vase is then sanded down to form a smooth surface and lacquered for long-lasting protection and a beautiful, rich finish. 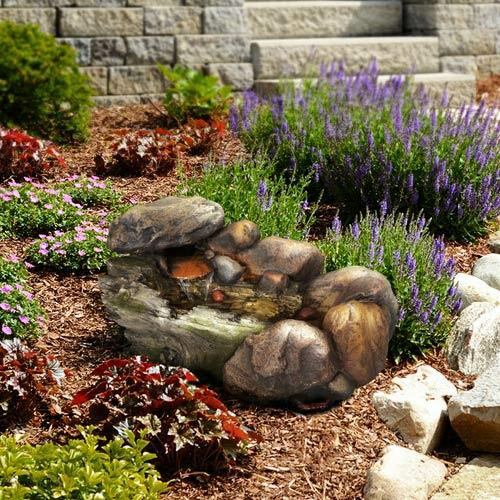 The result is an exquisite work of art that makes an ideal decorative piece in any setting. 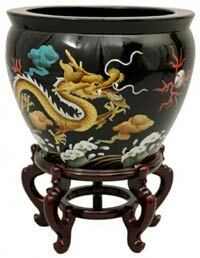 Our stylish Oriental vases can be placed on the floor, a stand or on a furniture piece. 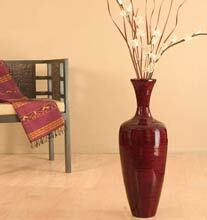 Enhance the look of each Oriental wooden vase by adding a colorful floral arrangement to them. 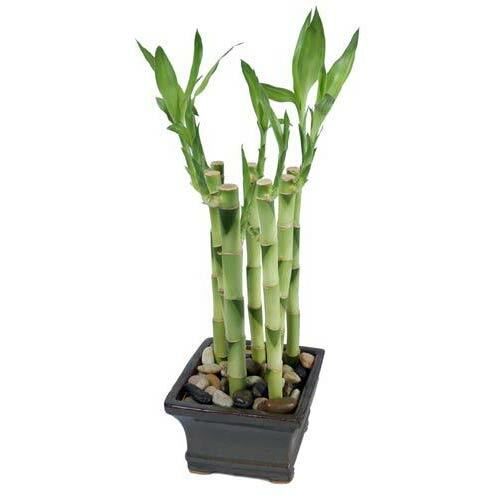 Please note that our bamboo and mangowood vases cannot hold water - a plastic container must be inserted into each vase for fresh flower arrangements. Try these wonderful floral vases in your home today to create a truly inspirational decorative impression. We have an exquisite assortment of Asian wooden table vases. Each table vase is handcrafted in Thailand, and made from high quality mangowood or bamboo. Each of these magnificent floral vases measures less than 20" in height and is ideal for displaying on a furniture piece or stand. Wooden vases are a great way to compliment any decorative scene as they lend a natural look to any backdrop. Separately sold floral arrangements can be placed in all of our wood table vases, adding the perfect decorative touch. Some of our Asian table vases come in two color choices, so click on each vase to see if additional colors are available. Each of our beautiful Chinese porcelain vases are hand-painted and crafted by a family of Chinese artists spanning back many generations. 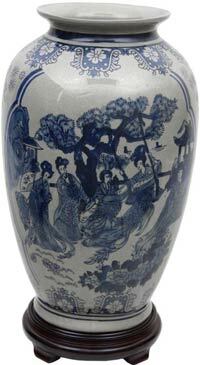 The porcelain vase is the distinctive and classical art piece that most people associate with Chinese crafts. Historically, porcelain vases dating back thousands of years have been found in mainland China, where the craft of vase-making originated. 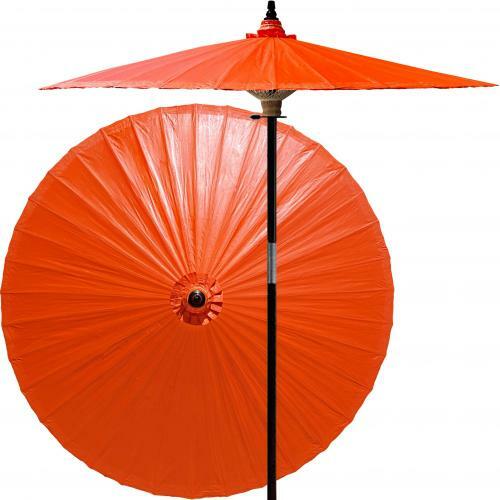 They have been used as decoration by emperors, nobility and common people down the centuries -- not just in China, but most of the world as well. All of our Chinese vases are lovingly painted by hand and then lacquered several times for a rich and elegant appearance. 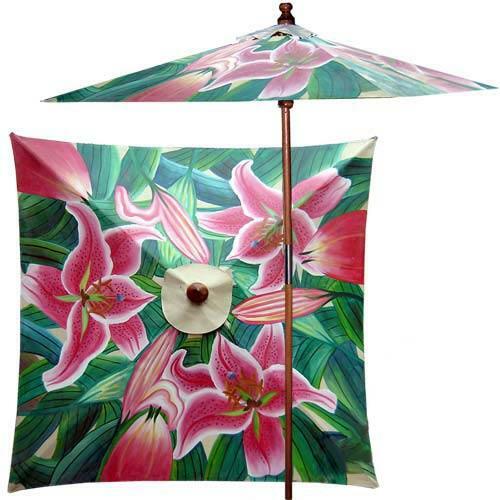 Place them on a stand, table or shelf for fine decoration. Our authentic porcelain vases are sure to provide a sophisticated and regal display in any area of your home. 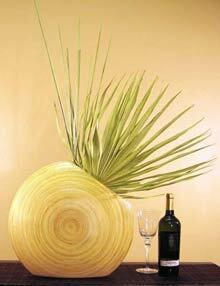 All of our decorative vases are fashioned out of high quality bamboo or mangowood and lacquered for a superb finish. Artisans in the north of Thailand use a special hand-turning technique to craft each decorative vase by hand. 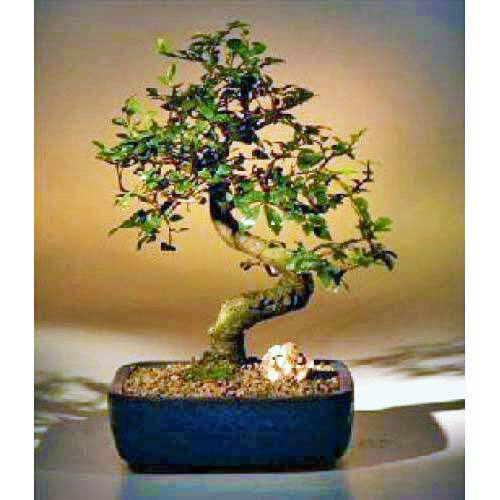 The result is a magnificent and artistic piece that is ideal as a stand alone wooden vase or floral vase. The vase collection here can be used on the floor or placed on a standing piece. Our decorative vases measure between 20" and 30" in height and are ideal as an inexpensive and stylish addition to your home or office. 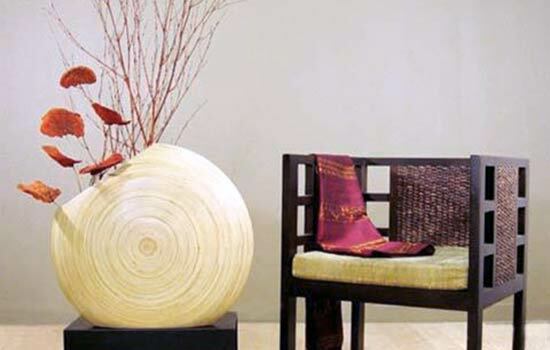 Embellish any of these Thai wooden vases with a dried or live floral arrangement for a captivating decorative touch. 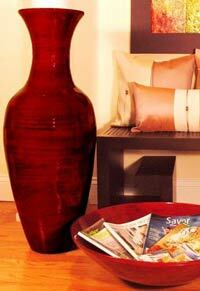 Our large floor vases make a beautiful decorative impact anywhere they are placed. Complimenting a wide variety of decorative settings, each large wood vase is handcrafted down to the finest detail and lacquered to perfection for a rich and elegant display. These large bamboo vases are ideal for using as an accent piece in a corner, in a dining room, next to a sofa or side chair, or in your entry foyer. 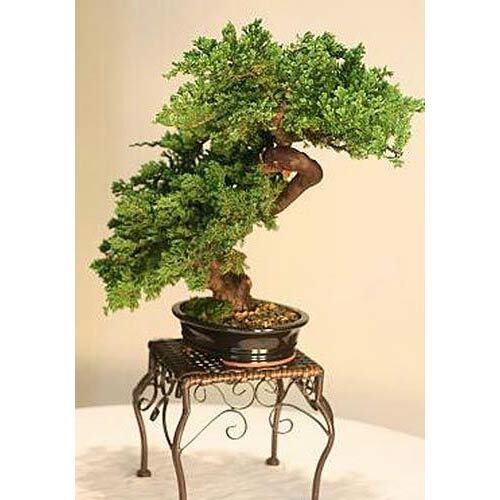 Option floral arrangements can be purchased, adding a superb decorative touch to each large floral vase. They add color and a natural flair to these already magnificent large floor vases. One of our tall wood vases placed in the right location will dramatically enhance the look of any room or area. Browse through our complete collection today. All of our Chinese fish bowls are made of porcelain and hand-painted by talented artists in China. A rich lacquer finish inside and out provides a breath-taking look and protects the fish bowl from dings and scratches. 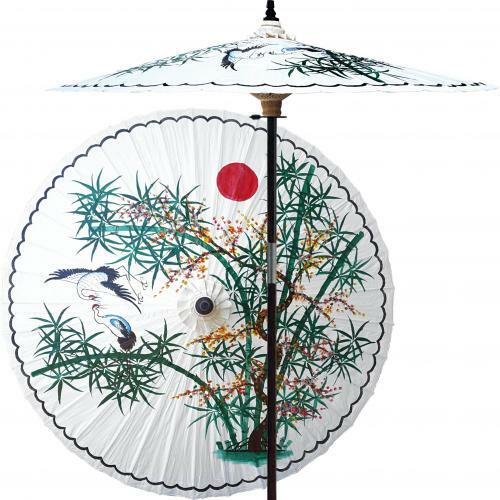 Any of these exotic fish bowls from China will make for beautiful Asian decor in many areas of your home or business. Most of our fish bowls come with an optional wooden stand that compliment their appearance and offer additional height for a better display. These exotic fish bowls will serve as fine decoration by themselves and will also look great with your choice of decor inside them. In China and in other parts of Southeast Asia it is common to see these large earthen bowls used as decoration to hold not only colorful fish, but also water lilies and other aquatic plants.